The left side shows the parts of the brain that move our body parts (motor strip). The right side shows the parts that sense our environment. 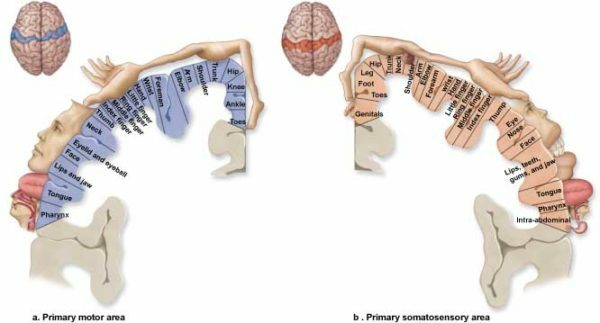 The Cortical Homunculus diagram shows how much of the brain is devoted to various parts of the body. The motor strip (action) parts of the brain “wiring diagram” are on the left, while the perception parts are on the right. Note the large percentage of these areas devoted to the hands. The second most important part of the operation involves the face and tongue. Humans are built from the brain out to be builders and communicators. This section explains the importance of this mind/body/environment loop. According to classic Liberal Arts (the Trivium), “Each of the liberal arts is both a science and an art in the sense that in the province of each, there is something to know (science) and something to do (art).” Art is also defined as something you get better at with practice, whereas science is simply known or unknown. One either knows the boiling point of water at sea level or one does not. Painting, writing, or music are arts in the sense that one (hopefully) improves with practice. Bear in mind we are reducing these terms to their core meaning, not referring to the fields of art and science as a whole. Symbols are how we represent, record, calculate and exchange ideas. These symbols may be letters, numbers, mathematical and chemical formulas, musical notes, lines, shapes, colors, textures and so on. Humans have the ability to render meaning through symbolic media such as writing, speech, drawing, and other methods. This symbolic conversion, and conversation, is a common thread of art and science. Symbolism allow us to store and transfer both the “noun” of static knowledge (science) and the “verb” of developing skills over time (art). Having this common thread between both art and science allows us to move from one level of skill and knowledge to new ones through invention and discovery. It also allows us to consolidate knowledge into “chunks” for easy recall and analysis. Invention is both an art and a science – it is rooted in knowing, but improves in quality with repeated work at physically building the item being invented. We must represent the problems and existing solutions symbolically, through knowledge (science). We also develop new ideas to resolve these problems over iterations or insights – again first through symbols (the science of recording the problem and the “as-is” state of solutions), and then through physical or symbolic design (the design and analysis of the new or “to-be” solution being invented). We associate science and engineering with each other the way we associate art and science, and for the same reason. Engineering and Science depend on each other and enhance each other, in much the same way a left and right leg enhance walking. Each step uses the previous step of the other leg as a foundation to move forward. We use new material science to engineer better instrumentation. In this way, science boosts engineering. That boosted engineering, in turn, leads to better instrumentation to advance material sciences. It’s said that one of the first things a blacksmith makes once they learn their craft is a better set of tongs. By doing so, they become more productive, and therefore can make other items more comfortably and efficiently. This cycle goes back and forth in all modern sciences and industries. A key example is using more advanced computers to enable the design of circuitry for still-more advanced computers. The pattern of advancement is not self-propagating – there must still be creative humans and a steady stream of investment in the loop. But the loops in critical industries – this feedback loop of humans, machines, sciences, and investors – has kept most technology advancing at various speeds consistently since the beginning of the second industrial revolution. It has worked in fits and surges prior to that from the first industrial revolution back to the dawn of civilization. People often speak of this area of study as STEM, which stands for Science, Technology, Engineering, and Math. Some add Art to the list and change the acronym to STEAM. This is rather messy nomenclature, rooted in educational subjects rather than the root terminology. Math is a science, and technology is a product of engineering. Art is not a separate category in the pure sense. We need artistic methods for things like user interfaces, digital renderings, visual communications, and so on. STEM, broken to categories, is a mix of the way of doing (engineering) with the way of knowing (science and it purest expression – math), along with the products of those three – technology. Art in this case is simply a specific expression of doing, but with different methods and media (usually) than those used by the engineer. Art (as a product) is also the purest form of symbolic expression, be it representational or abstract. There is much to be said about the relationship between arts and sciences, but the key focus here is the relationship between symbolism and learning (science), as well as learning by doing (art). There are different ways that humans learn. This is true whether one is learning from an instructor, reading a book, or inventing a field of discovery in a laboratory. When information is being communicated from a person who knows the science and practices the art (teacher) to a student, they may use verbal, written, visual, or kinesthetic (action) methods. The first three methods transfer science, or knowledge. The last method, also called “learning by doing”, transfers both science and art. One cannot become a professional athlete, painter, or sculptor simply by reading about it. The mind/body interface needs to be “rewired” through practical motion to operate a paint brush, welding torch, or fiberglass resin brush correctly. There is a key interaction between these two categories of learning, just as there is a key interaction between arts and sciences themselves. The sciences and symbols are communicated to the conscious, higher mental functions from outside the individual person. This communication allows learning via the medium of transferred symbols, such as speech and text. Once one understands intellectually WHY and HOW to do something, and with what, that knowledge guides the ability to wield hands and tools. One slowly, by doing, links the intellectual, conscious abilities with kinesthetic motor skills. This forms a feedback loop that enhances both knowledge and art. One learns at the material level how to correctly wield tools by defining the motions before the action, and evaluating the quality of the action after each step. One learns exactly how hard to hit a chisel to split plaster versus stone, or which angles to hold a fan brush comfortably while painting a sky. Some motions will become more natural and “pre-programmed subroutines” over time, such as the angle to use a chisel, torch, or fan brush. While this is going on, one also gains a “feel” for the tools and media. One realizes just how much flux to add to a welding bead or how much cobalt blue to mix with white to make an evening sky. These methods also apply to me typing these words, as I think of sentences and simply let my fingers, after decades of practice, convert those words into symbols. What was once a learned behavior in High School typing class, and became natural in college programming classes, is now something I no longer think about at all. There are several lessons to draw at this point. Learning arts is not easy, though some arts, like some sciences, are easier for some people than others. I can build a bench, but don’t ask me to play baseball or piano. It’s possible I would be better at these things had I the right instructor in childhood, or even now if I put the time in. I know a number of people in their forties who have learned how to sing well after a lifetime of frustration for both themselves and anyone within earshot. Even a professional opera singer I know says her practice sessions are not easy on bystanders. So how does one go from learning something cognitively to knowing how to physically craft and create with skilled hands? How does one cross the gap between conscious and subconscious symbolism? By “subconscious symbolism”, I mean the process by which we write neural “subroutines” to say, “Decide if the pitch is a strike or ball” or “type the letter Q”. This is usually called muscle memory, but can also apply to snap perceptions as well as reflexive actions. This transition has three key pieces – the symbolic science, the motor-skill art, and the ability to communicate the relationship between them clearly. When I was in my early twenties, my father was teaching me how to taxi on the ground in a twin engine aircraft (a 1953 Piper Apache, specifically). When we came to a turn on a taxiway or runway, he told me to “lead with the engine”. When I attempted to turn it like a single-engine aircraft, I would get a sharp rebuke to “lead with the engine”. My father was a production test pilot in the 1950’s with 1.3 YEARS of logged air time, an aircraft and power-plant (engine) mechanics license, and too many accomplishments and adventures to count. He knew both intellectually and physically how to fly an aircraft far better than I ever could. But unfortunately, this led to some abrupt symbolic shorthand when describing processes he’d long since subsumed into his subconscious mind in favor of knowing new abstractions, like knowing which switches to flip when a six-engine jet is on fire. My father's 1953 Piper Apache from the early 2000's. Over the course of a few tries, I worked out what he meant. Here is a breakdown of the process of making a turn in a twin-engine prop aircraft on the ground. About two plane-lengths from the turn, add roughly three percent power to the motor on the outside of the turn. This will begin a shift in the inertia across the aircraft over the coming seconds. The inertia of the 4500-pound aircraft will “tip” about the time you need to start turning with the nose wheel. The plane will go from moving forward in a straight line to wanting to turn in the direction away from the more powerful engine. This will make the turn easier, because the inertia of the aircraft is already turning. This is basic Newtonian physics. You are essentially manipulating the aircraft momentum as if it weren’t on the ground, because it barely is. The bulk of the weight is resting on the two main landing gear. The nose wheel, which does the steering, is bearing a fraction of that mass. Fortunately, those big props and engines are not useless on the ground. They are still working not only to push the aircraft down the taxiway back to the hangar, but to help with turns like this one. As you start the turn, deaden the difference with the outboard motor – you don’t want too much inertia rotating the aircraft, and the bump you gave it in step 1 has already done its job. Now it’s time to clean up the results. Halfway through the turn, bump the throttle to the motor inside the turn about five percent. This deadens the turn momentum fairly quickly. You can feel this momentum within the aircraft and judge how much or how little throttle to give, and for how long, with experience. It’s been many years since I’ve done this – I’m basically guessing at the percentages. As the aircraft completes the 90 degree turn onto the taxiway, push the rudder pedals to aim the aircraft straight again. While doing this, confirm the throttles are balanced. Listen to the engines to confirm they are synchronized (make a dull flat hum) instead of out of sync (making a slow rise-fall osculation). There is also the issue that nose wheels are expensive, as are brake pads. Pilots tend to do as much ground steering and stopping with fuel, flaps, and elevators as physics will allow before resorting to depreciating the wheels and brakes with wear and tear. While all this is going on, as with a single engine aircraft, you are being mindful of the winds and angling the control surfaces so that a gust will drive the plane downward into the landing gear safely rather than tip the aircraft like a leaf on the wind. So… Got all that? Did you get all that from “lead with the engine”, or did it have to be expanded a bit? Those four short words do encapsulate the concept of using the engines to set moments of inertia and minimize the stress on the landing gear. My closeness to my father was helpful in unpacking his tendency to say things in short bursts. For the record, I have to rewrite these chapters at least twice to overcome my own tendency to say things in personal mental shortcuts. It is key to really, completely understand the key concepts before moving on. You should know your basic sciences and arts like you know your own phone number and address. For that, you will need good communicators as your mentors. Which is the other reason I keep rewriting these chapters for clarity – so that my work will be of value to you, the reader, in forming these foundations. One of the beauties of symbolic writing and representation is that your mentors don’t have to be physically present, or even alive. Leonardo di Vinci is still teaching artists and inventors five centuries after his death. You just learned how to turn a twin engine aircraft on the ground from my father, who passed away in 2004. For the creator and teacher – your best students may never meet you in space or time, but may only be learning from the symbolic artifacts you leave behind. By extension, one can also leave a legacy of transferred skills with students, and the artifacts they, in turn, leave behind. We have an example with European martial arts. We tend to think of martial arts as Kung Fu, Judo, or other Asian fighting skills that have been passed down from master to student, uninterrupted, for centuries. In Europe, skill with longsword techniques peaked several centuries ago, then died out with the invention of personal firearms. All that remain are woodcuts diagrams with intentionally-cryptic descriptions. This was to allow the instructor to make a living teaching students personally, because someone stealing a book without the personal instruction would be lost trying to read it. Think of it as intellectual property protection, as practiced 400 years ago. The terms in the inscriptions were meant to be reminders to students who he had taught, rather than knowledge transfer to people he had not met. As such, it has taken much effort by modern martial artists to reconstruct the techniques. Even then, there are some actions that are taught two different ways, because either method matches the woodcut drawing and description equally well. While the phrase, “lead with the engine” was maddening to me in my twenties, it was a key bit of symbolic shorthand to my test pilot father in his twenties. With great skill and knowledge, the mind tends to group, condense, and distill complex building blocks of thought into small packages with short labels. The key point here is summarized in a 1956 cognitive psychology study called “The Magic Number is Seven, Plus or Minus Two” by George A. Miller. This relates to the idea of working memory capacity. The ability to break complex thoughts down to seven components, or abstract simple ones up to seven components for more detailed analysis, is called “chunking”. It has all kinds of applications, from the length of phone numbers (seven digits) to advertising jingles and hooks in pop music choruses. The mind has a tendency to start dropping key elements when one has to deal with ideas with more than seven components. Astronaut and advanced pilot training involves putting the subject in a simulator and throwing more and more problems at the pilot until they start making mistakes. The art of passing the test is to handle as many problems as possible with skill. Once one is overwhelmed, one has to drop the problems in the correct order, from the least significant to the most dangerous. One can only get so far with a few elemental chunks. To handle complex concepts, one must lump these elements into more complex “molecules” with their own properties. One can then work with the complex concepts as if they were simple. My father had a single mental box labeled “lead with the engine.” He had used as a single concept for so long (over four decades at that point) that he had, to some degree, lost the natural verbal ability to unpack it. If one concatenates thoughts into symbolic shorthand, one effectively can put more “chunks” into a mental theory or concept than someone who has to have everything broken down to the smallest possible building block. Genius, to a large degree, can be thought of as how well one can manipulate complex concepts as if they were simple ones. Be aware that there is a danger of this in terms of creativity. One who knows a field very well may be tempted to Reason by Analogy, rather than Reason from First Principles. One must be careful to put one’s molecular concepts together accurately. A misunderstanding at the early stages of learning will result in skewed results for as long as that block remains intact and unexamined. Entire fields of academic thought are built around intentionally or unintentionally flawed core concepts. A true master of a field can not only assemble complex thoughts from existing symbolism, but break down the terms of the original science to look for errors. My brother was a chemist at a major earthmoving equipment manufacturer. They received one of one hundred advanced spectrometers with advanced computer controls. He immediately checked the calibration of the instrument against wet chemistry methods, which are considered a gold standard for chemical analysis. In so doing, he found numerous software bugs that made the instrumentation’s readings highly suspect. He wrote a long bug report of the issues he found and e-mailed it to the manufacturer. A month later, a new software release was announced by the manufacturer. He installed it, then rechecked the results. Finding them accurate, he put the instrument into production. “No.” – came the rather passive response. Let that sink in a bit. For a month, many top industries on the scale of his were doing analysis and quality control with bad instrumentation. I’m not sure which ones, or if they rechecked things later and caught errors, or if there was a lasting impact. But there it is – all from one software release for one industrial instrument. And there are thousands of such instruments made. Each one forms a sort of “symbolic shortcut” in our industrial and scientific infrastructure as a global economy. My brother told his sons, both of whom have MS degrees, “Never trust software results. Get out your scientific calculator and check the results before trusting the software.” One son did so with civil engineering software on water tower design and found similar bugs. ALWAYS check your complex concepts, your terms, your shortcuts, formulae, software, and equipment. Know the roots of your learning historically, and from multiple perspectives. If you are inventing something new, validate it against the hardest sciences possible, from as many perspectives as possible. Do the math – forwards and backwards. Consider sources. The best inventors, or artists for that matter, know their media by having worked in it for years. An architect may go to a CAD system or drafting table and do designs, without ever having nailed a board or poured concrete. Such an architect is not going to have a kinesthetic sense of the materials with which buildings are made. However, look at the greatest inventor/entrepreneurs. They got their hands dirty in the fields where they did invention. R. G. LeTourneau worked in a metal foundry at age 14 in the year 1900. Edison, Tesla, and so on physically built their inventions. Lockheed Skunk works, which built the most advanced aircraft of the Twentieth Century, was unique in that they put all the engineers and designers in with the assembly workshops. This closed the loop between thinking and doing as tightly as possible for such complex projects. Even artists of earlier centuries formulated their own paints. Burt Rutan refined his knowledge of aviation with model aircraft and work as a test pilot’s flight engineer prior to building his first experimental aircraft. The best inventors know their working media. The ability to do work with your hands with the design materials, be they software or steel, leads to better and more realistic designs. This is how our brains are wired – so work with it. Once you can work with materials both mentally and physically, you can master the media and create new works that are both realistic and visionary. You learn the subject at both a conscious and subconscious level. Humans are built specifically to work with our hands and senses, and we have the brain maps to prove it. The process of learning by doing can be complex. Make sure you get good mentors in the craft, or you will develop bad habits that are difficult to unlearn. Know your media, your tools, and your design – both symbolically and kinesthetically. Knowing your media and concepts backwards and forwards, without built-in mistakes, is the strongest foundation for invention and discovery.